The other day, my oldest daughter, Hafsah, requested that I trim her nails for her, as her nails were getting quite long. I happily agreed and started searching for the nail cutter in the washroom. I checked the usual spot – in the drawer…nope, not there. I checked the other drawer…nope, not there either. Suddenly, Hafsah started bawling her eyes out, and through her tears she cried, “You don’t like the way I organize things!” Ummm…ohhhkaaaay? I was confused. “I organized the washroom for you, but you can’t find the nail cutter now; which means you don’t like the way I organize things, NOW I’m never going to organize anything ever again!” Hafsah exclaimed. ‘AND THIS IS WHY I DON’T HOMESCHOOL MY CHILD!’ I thought to myself. Shortly after, my son Idrees started crying because he wanted me to wipe the snot from his nose. Next in line to cry was my daughter Madina…because she wanted some attention. ‘AND THIS IS ANOTHER REASON WHY I DON’T HOMESCHOOL MY CHILD’ I thought to myself once again. From a young age, Hafsah has been very sensitive, and she seems to takes things personally. Despite my efforts to always encourage her, and to not expect perfectionism from her, she will assume that she is not good enough. When doing research, I found that in most cases, the oldest child is expected to be the ideal child, and often parents have high expectations for their oldest child. Knowing this, I deliberately try to raise all my children equally, and therefore I do not have unrealistic expectations for Hafsah, or my other children. On a daily basis, I reassure my daughter that she is a wonderful person, daughter, sister, student, and friend. I inform my daughter that mistakes are normal, and that we learn and grow from them. I feel like I’m trying my best to convince Hafsah that she doesn’t need to be perfect, but she just doesn’t understand this. I painfully think back to the days, prior to Hafsah going to school, when I was attempting to teach her how to write her name. Those were not happy days, as there were many tears and tantrums – from both of us. Hafsah struggled with writing the perfect ‘H’: the lines were not straight enough, the lines were not equal in length, and the letter itself was crooked…I just wanted to rip the hijab off my head, and pull the hair that was beneath it!!! Are you serious my child?! Here I was praising her because she learned how to write so quickly, and there she was crying because the letters were not perfect enough! In all honestly, I didn’t know how to handle her perfectionism at that time, as I have extremely messy handwriting and could care less if it is neat or not. I’am by no means a perfectionist myself…but my husband tells me he might have been when he was younger – he doesn’t quite remember. Of course he doesn’t. Nonetheless, I struggled to teach my child to write her name amongst teaching her to do other things. Another not-so-pleasant memory was the time when Hafsah really wanted to learn how to put her hair into a ponytail….When Hafsah initially requested I teach her how to tie her hair, I hesitated because I knew what would happen – and that is what happens every time I teach Hafsah anything – troubles, tears, and tantrums! Knowing that I’am her parent and that I’am her first teacher, I attempted to teach her how to tie her hair into a ponytail. Three minutes into the demonstration she started crying because she couldn’t do it. I told her she needed practice and that she could practice on her dolls, and I told her that she would not learn in one day. She didn’t care for my words- she wanted to tie her hair in a pony tail that day! She even refused to let me tie her hair for her, and spent the day having her thick hair strands in her face and in her food. Now, you’re probably wondering if Hafsah is like this in school…and the answer is no. In fact, after a couple of days from her first day of school she proudly showed me her hand drawn picture from art class that had her name written on it, and guess what? Her name was not written perfectly, it even had some letters missing – BUT she didn’t care and she didn’t even seem to notice! Hafsah is now in grade two and attends regular public school, and is thriving in the academic world. Her teachers say she is very intelligent, and they have not noticed her perfectionism. Hafsah’s behaviour at school has made me realize that she is only a perfectionist at home, and not at school. Perhaps, at school she sees other children struggle with some things, and she notices that struggling is normal. At home, Hafsah is the oldest child, therefore she doesn’t have an older sibling to show her that struggling is okay. Furthermore, it is likely that she is setting her standards high from observing my husband and I doing things with ease. Whatever the reason is for Hafsah’s perfectionism at home, it has made me feel that she is better off going to school rather than being homeschooled! Hafsah: Reading her book to me. Madina: Sits on her baby brother’s lap. Idress: Starts pulling Madina’s hair. Hafsah: “Argh, no one cares about me and you all want me to fail school!” Stomps her feet and runs upstairs in tears. And that folks, is what happens during home reading time 9/10 times. 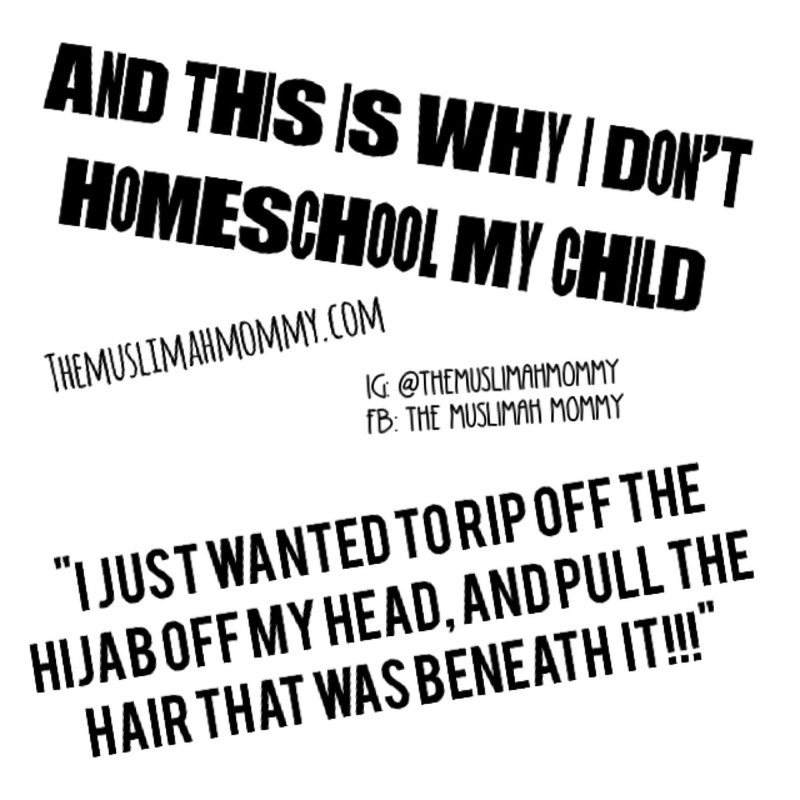 Now imagine what would happen if I were to teach Hafsah an entire curriculum…let’s not even go there!!! To save the stress – and my hair – I believe I have made the correct decision for Hafsah…and for my sanity! Ahh the joys of being a mommy. I think we have so many roles already as a mother. Adding formal teacher to that would be just madness. Kudos to the mummies who actually do this and get it right. I sure hope she grows out of it Aleisha! After seeing her marks at school, I have to say that my decision for her was the right one! @themuslimahmommy I took on the task of being my children primary educator this year and I’ll tell you this it definitely requires a lot of patience but isn’t that what mothers are suppose to have anyway? Lol. I feel like I am actually getting to know my kids all over again because I was in school while they were in toddler/prek. It definitely gets easier over time because you look at the overall picture of homeschooing that is learning should be fun , encouraged and of course each child have their own way of learning. I homeschool my children because I feel that I could teach them better than anyone else. Secondly I homeschool them because I want them to be surrounded in a islamic environment .. Imagine this . Children are at school for 6 hours with not hearing Allahu Akbar , bismillah , alhumdulilah , no prayer , no islamic teaching . By the time they come home they are tired .. They do some hw and eat dinner and are off to bed . Whose behavior or standards do you think children are likely to adapt? Anyway. I would suggest an islamic school if I were you sister . May Allah grant you and yr family ease.